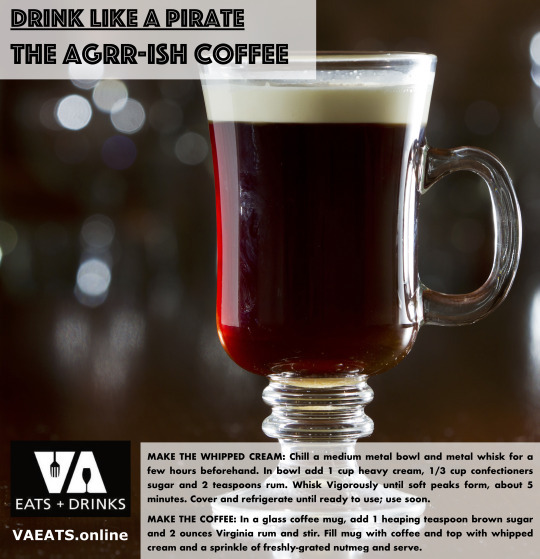 Let’s warm up to the coldest time of the year (so says meteorologist Tim Pandajis) with a Virginia-ized version of Irish coffee. MAKE THE WHIPPED CREAM: Chill a medium metal bowl and metal whisk for a few hours beforehand. In bowl add 1 cup heavy cream, 1/3 cup confectioners sugar and 2 teaspoons rum. Whisk Vigorously until soft peaks form, about 5 minutes. Cover and refrigerate until ready to use; use soon. MAKE THE COFFEE: In a glass coffee mug, add 1 heaping teaspoon brown sugar and 2 ounces Virginia rum and stir. Fill mug with coffee and top with whipped cream and a sprinkle of freshly-grated nutmeg and serve. On the January 19, 2018 episode of The Virginia Eats + Drinks Show, we crafted this cocktail using freshly-brewed coffee from Cafe Stella [LINK] in Norfolk and rum from Dead Reckoning Distillery [LINK], also in Norfolk.